Today is the birthday (1859) of Jerome Klapka Jerome, an English writer best known for the comic travelogue Three Men in a Boat (1889). Other works include the essay collections Idle Thoughts of an Idle Fellow and Second Thoughts of an Idle Fellow, as well as the sequel to Three Men in a Boat, Three Men on the Bummel. Jerome was born in Caldmore, Walsall, England. He was the fourth child of Jerome Clapp (who later renamed himself Jerome Clapp Jerome), an ironmonger and lay preacher, and Marguerite Jones. He had two sisters, Paulina and Blandina, and one brother, Milton, who died at an early age. Jerome was registered, like his father’s amended name, as Jerome Clapp Jerome, and the Klapka appears to be a later variation (after the exiled Hungarian general György Klapka). Owing to bad investments in the local mining industry, the family fell into poverty and debt collectors visited often, an experience Jerome described vividly in his autobiography My Life and Times (1926). 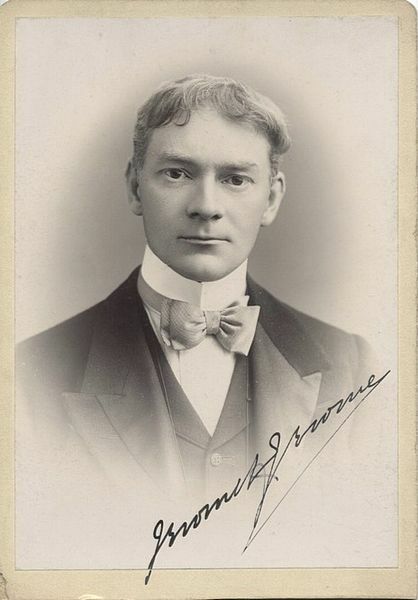 The young Jerome attended St Marylebone Grammar School. He wished to go into politics or be a man of letters, but the death of his father when Jerome was 13 and of his mother when he was 15 forced him to quit his studies and find work to support himself. He was employed at the London and North Western Railway, initially collecting coal that fell along the railway, and remained there for four years. In 1877, inspired by his older sister Blandina’s love for the theatre, Jerome decided to try his hand at acting, under the stage name Harold Crichton. He joined a repertory troupe that produced plays on a shoestring budget, often drawing on the actors’ own meager resources – Jerome was penniless at the time – to purchase costumes and props. After three years on the road with no evident success, the 21-year-old Jerome decided he had had enough of stage life and sought other occupations. He tried to become a journalist, writing essays, satires and short stories, but most of these were rejected. Over the next few years he was a school teacher, a packer, and a solicitor’s clerk. Finally, in 1885, he had some success with On the Stage — and Off (1885), a comic memoir of his experiences with the acting troupe, followed by Idle Thoughts of an Idle Fellow (1886), a collection of humorous essays which had previously appeared in the newly founded magazine, Home Chimes, the same magazine that would later serialize Three Men in a Boat. On 21 June 1888, Jerome married Georgina Elizabeth Henrietta Stanley Marris (“Ettie”), nine days after she divorced her first husband. She had a daughter from her previous, five-year marriage nicknamed Elsie (her actual name was also Georgina). 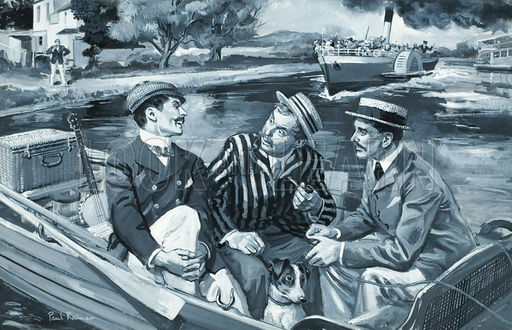 The honeymoon took place on the Thames “in a little boat,” a fact that was to have a significant influence on his next, and most important work, Three Men in a Boat. Jerome began to write Three Men in a Boat as soon as the couple returned from their honeymoon. In the novel he replaced his wife with his longtime friends George Wingrave (George) and Carl Hentschel (Harris). This allowed him to create comic (and non-sentimental) situations which he intertwined with the history of the Thames region. The book, published in 1889, became an instant success and is still in print. Its popularity was such that the number of registered Thames boats went up fifty percent in the year following its publication, and it contributed significantly to the Thames becoming a tourist attraction. In its first twenty years alone, the book sold over a million copies worldwide. It has been adapted to movies, television and radio shows, stage plays, and even a musical. Its writing style influenced many humorists and satirists in England and elsewhere. With the financial security the sales of the book provided, Jerome was able to dedicate all of his time to writing. He wrote a number of plays, essays and novels, but was never able to recapture the success of Three Men in a Boat. In 1892 he was chosen by Robert Barr to edit The Idler (over Rudyard Kipling). The magazine was an illustrated satirical monthly catering to gentlemen who, following the theme of the publication, appreciated idleness. In 1893 he founded To-Day, but had to withdraw from both publications because of financial difficulties and a libel suit. Jerome volunteered to serve Britain at the outbreak of the First World War, but, being 56 years old, was rejected by the British Army. Eager to serve in some capacity, he volunteered as an ambulance driver for the French Army. In 1926, Jerome published his autobiography, My Life and Times. Shortly afterwards, the Borough of Walsall conferred on him the title Freeman of the Borough. During these last years, Jerome spent more time at his farmhouse in Ewelme near Wallingford. In June 1927, on a motoring tour from Devon to London via Cheltenham and Northampton, Jerome suffered a paralytic stroke and a cerebral hemorrhage. He lay in Northampton General Hospital for two weeks before succumbing on 14 June. He was cremated at Golders Green and his ashes buried at St Mary’s Church, Ewelme, Oxfordshire. Elsie, Ettie, and his sister Blandina are buried beside him. A small museum dedicated to his life and works was opened in 1984 at his birth home in Walsall, but this closed in 2008. I can’t sit still and see another man slaving and working. I want to get up and superintend, and walk round with my hands in my pockets, and tell him what to do. It is my energetic nature. I can’t help it. I don’t know why it should be, I am sure; but the sight of another man asleep in bed when I am up, maddens me. It is always the best policy to tell the truth, unless of course you are an exceptionally good liar. For other breakfast things, George suggested eggs and bacon, which were easy to cook, cold meat, tea, bread and butter, and jam. For lunch, he said, we could have biscuits, cold meat, bread and butter, and jam – but NO CHEESE. Cheese, like oil, makes too much of itself. It wants the whole boat to itself. It goes through the hamper, and gives a cheesy flavour to everything else there. You can’t tell whether you are eating apple-pie or German sausage, or strawberries and cream. It all seems cheese. There is too much odour about cheese. 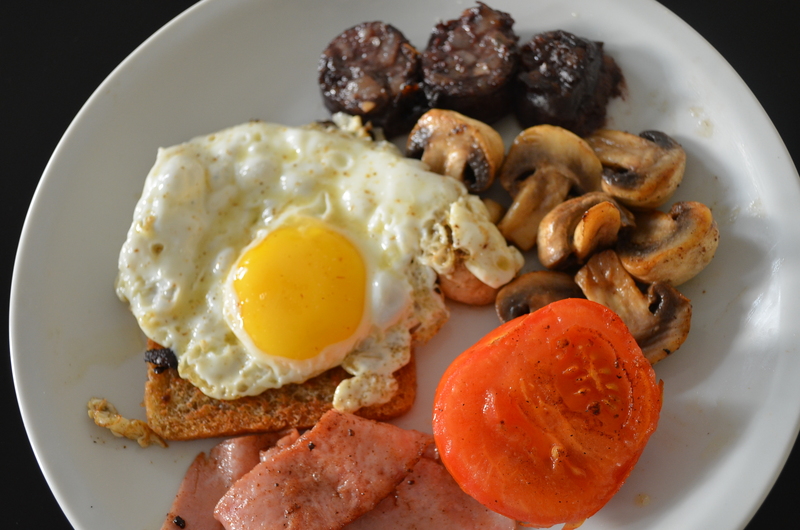 The current “full English” is a much pared down version of this Victorian feast, but, nevertheless, still substantial. A “good fry up” as it is usually called, is nowadays reserved for weekends when busy families have the time not only to cook such a meal, but also to be able to sit together and eat at leisure. In my youth the “full English” was the province of cafés during the week. George’s Café in the covered market in Oxford was always packed to overflowing at breakfast time, mostly with bus drivers and market workers, who had already done part of their shift, and were tucking into eggs and bacon with buckets of sweet milky tea — toast and dripping on the side. I believe most of these places have vanished (unless readers tell me otherwise). Eggs. Usually these are fried (one per person), with the yolk runny. Poached would be all right, but is not quite the thing. Scrambled are good for a big crowd when you don’t want to cook eggs to order. Meat. Bacon is hyper-traditional, but it should be back bacon that is very meaty. People in the U.S. can often get this in supermarkets labeled “Canadian bacon.” I can’t get bacon at all in Argentina except Italian styles. 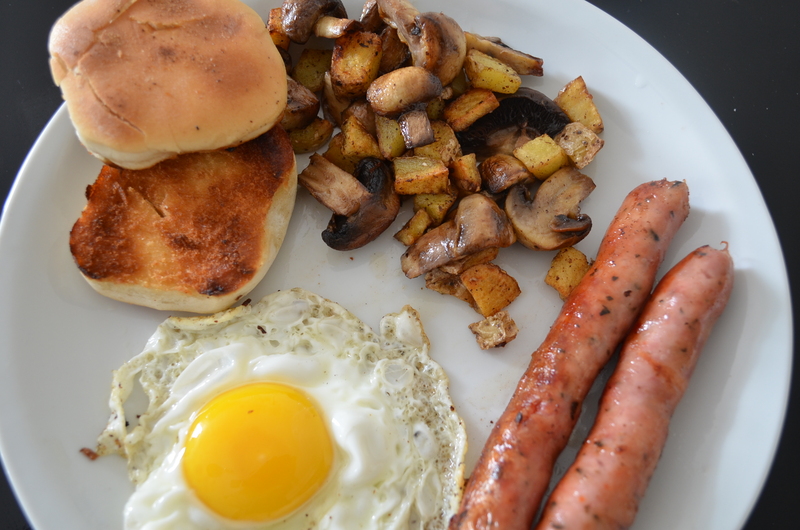 Sausages are also a good breakfast meat, nicely browned. Ham steaks are a rare treat, also well browned. Bread. Toast is usual. It should be well buttered and served with a pot of English marmalade. Customarily people will eat the eggs and bacon with buttered toast, and then add some marmalade to finish off, with tea. Fried bread is also common. You simply fry the bread until it is golden and then put the egg on top. Breakfast rolls, preferably toasted, will also pass muster. Tea. Here I part ways with normal customs in my own habits. I rarely drink tea any more (yerba mate is my thing). But when I do indulge, I drink it like the Chinese – relatively weak and with nothing added. Of course, I use high quality imported Chinese teas. The English “cuppa” deserves a whole blog post to itself. Here I will just say that English Breakfast tea is the standard. Earl Grey and the like are for wimps, and certainly not suitable for breakfast. English Breakfast tea is strong and black, an eye opener, meant to be brewed dark with milk (and sugar if you like) added. Potatoes. These can be hashed or chipped but must be fried. Tomatoes. Use small-ish tomatoes, halve them, and sear them on both sides. They must be warm throughout when served. Mushrooms. Halve or quarter them, and sauté them in butter until golden. Kidneys. Use lamb’s kidneys. Cut them in half and remove all the white bits from the inside. Then cut them in bite-sized pieces and serve them fried in butter, or fried with a piquant English mustard sauce. Black pudding. This is a northern English blood sausage which people either love or despise. It should be sliced in thick rings and fried on both sides. Baked beans. These have always been a standard filler – straight out of the can and heated through. I’m not partial, but many are. These are the standard accoutrements. I am sure I, or others, could add more. There are also other classic English breakfasts, such as kippers or kedgeree, which, no doubt I will wax lyrical about some other time.